Boston Mayor Martin Walsh speaks at a news conference last month. He and the USOC announced Monday that his city is no longer in the running to host the 2024 Olympics. It's official. 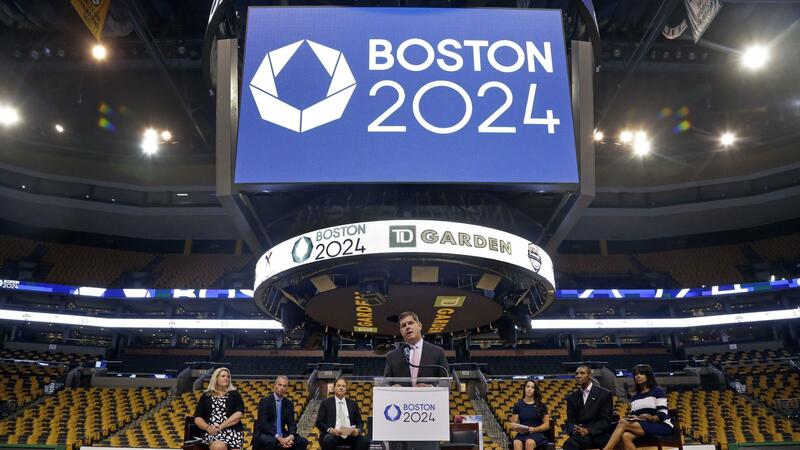 The 2024 Olympic Games will not take place in Boston. The Associated Press reports that the U.S. Olympic Committee "severed ties" with Boston on Monday. In a statement, Boston Mayor Martin J. Walsh said, "I strongly believe that bringing the Olympic Games back to the United States would be good for our country and would have brought long-term benefits to Boston." He continued, "However, no benefit is so great that it is worth handing over the financial future of our City and our citizens were rightly hesitant to be supportive as a result." Walsh had previously said the U.S. Olympic Committee had been pressuring him to commit to having local taxpayers pick up the tab if the operation went over budget, according to Curt Nickisch of WBUR. And as we previously reported, almost half of Bostonians polled by WBUR opposed taking on the responsibility of the Olympics. In a statement, U.S. Olympic Committee CEO Scott Blackmun said the USOC has "not been able to get a majority of the citizens of Boston to support hosting the 2024 Olympic and Paralympic Games." The statement continued, "Therefore, the USOC does not think that the level of support enjoyed by Boston's bid would allow it to prevail over great bids from Paris, Rome, Hamburg, Budapest or Toronto." The statement also said that while the USOC "would very much like to see an American city host the Olympic and Paralympic Games in 2024," and will begin exploring opportunities for another bid city, they "understand the reality of the timeline," which suggests another city might not be selected soon enough to make a bid. The Boston Globe reports that experts believe two-time Olympic host Los Angeles could be an alternate bid city, and quotes Los Angeles Mayor Eric Garcetti saying, "I continue to believe that Los Angeles is the ideal Olympic city and we have always supported the USOC in their effort to return the Games to the United States. ... I would be happy to engage in discussions with the USOC about how to present the strongest and most fiscally responsible bid on behalf of our city and nation."